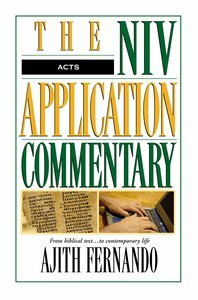 About "Acts (Niv Application Commentary Series)"
NIV Application Commentary Series Introduction The NIV Application Commentary Series is unique. Most commentaries help us make the journey from the twentieth century back to the first century. They enable us to cross the barriers of time, culture, language, and geography that separate us from the biblical world. Yet they only offer a one-way ticket to the past and assume that we can somehow make the return journey on our own. Once they have explained the original meaning of a book or passage, these commentaries give us little or no help in exploring its contemporary significance. The information they offer is valuable, but the job is only half done. Recently, a few commentaries have included some contemporary application as one of their goals. Yet that application is often sketchy or moralistic, and some volumes sound more like printed sermons than commentaries. The primary goal of The NIV Application Commentary Series is to help you with the difficult but vital task of bringing an ancient message into a modern context. The series not only focuses on application as a finished product but also helps you think through the process of moving from the original meaning of a passage to its contemporary significance. These are commentaries, not popular expositions. They are works of reference, not devotional literature. The format of the series is designed to achieve the goals of the series. Each passage is treated in three sections: Original Meaning, Bridging Contexts, and Contemporary Significance. This section helps you understand the meaning of the biblical text in its first-century context. All of the elements of traditional exegesis --- in concise form --- are discussed here. These include the historical, literary, and cultural context of the passage. The authors discuss matters related to grammar and syntax, and the meaning of biblical words. They also seek to explore the main ideas of the passage and how the biblical author develops those ideas.1 After reading this section, you will understand the problems, questions, and concerns of the original audience and how the biblical author addressed those issues. This understanding is foundational to any legitimate application of the text today. This section builds a bridge between the world of the Bible and the world of today, between the original context and the contemporary context, by focusing on both the timely and timeless aspects of the text. God's Word is timely. The authors of Scripture spoke to specific situations, problems, and questions. Paul warned the Galatians about the consequences of circumcision and the dangers of trying to be justified by law (Gal. 5:2 -- 5). The author of Hebrews tried to convince his readers that Christ is superior to Moses, the Aaronic priests, and the Old Testament sacrifices. John urged his readers to 'test the spirits' of those who taught a form of incipient Gnosticism (1 John 4:1 -- 6). In each of these cases, the timely nature of Scripture enables us to hear God's Word in situations that were concrete rather than abstract. Yet the timely nature of Scripture also creates problems. Our situations, difficulties, and questions are not always directly related to those faced by the people in the Bible. Therefore, God's word to them does not always seem relevant to us. For example, when was the last time someone urged you to be circumcised, claiming that it was a necessary part of justification? How many people today care whether Christ is superior to the Aaronic priests? And how can a 'test' designed to expose incipient Gnosticism be of any value in a modern culture? Fortunately, Scripture is not only timely but timeless. Just as God spoke to the original audience, so he still speaks to us through the pages of Scripture. Because we share a common humanity with the people of the Bible, we discover a universal dimension in the problems they faced and the solutions God gave them. The timeless nature of Scripture enables it to speak with power in every time and in every culture. Those who fail to recognize that Scripture is both timely and timeless run into a host of problems. For example, those who are intimidated by timely books such as Hebrews or Galatians might avoid reading them because they seem meaningless today. At the other extreme, those who are convinced of the timeless nature of Scripture, but who fail to discern its timely element, may 'wax eloquent' about the Melchizedekian priesthood to a sleeping congregation. The purpose of this section, therefore, is to help you discern what is timeless in the timely pages of the New Testament --- and what is not. For example, if Paul's primary concern is not circumcision (as he tells us in Gal. 5:6), what is he concerned about? If discussions about the Aaronic priesthood or Melchizedek seem irrelevant today, what is of abiding value in these passages? If people try to 'test the spirits' today with a test designed for a specific first-century heresy, what other biblical test might be more appropriate? Yet this section does not merely uncover that which is timeless in a passage but also helps you to see how it is uncovered. The author of the commentary seeks to take what is implicit in the text and make it explicit, to take a process that normally is intuitive and explain it in a logical, orderly fashion. How do we know that circumcision is not Paul's primary concern? What clues in the text or its context help us realize that Paul's real concern is at a deeper level? Of course, those passages in which the historical distance between us and the original readers is greatest require a longer treatment. Conversely, those passages in which the historical distance is smaller or seemingly nonexistent require less attention. One final clarification. Because this section prepares the way for discussing the contemporary significance of the passage, there is not always a sharp distinction or a clear break between this section and the one that follows. Yet when both sections are read together, you should have a strong sense of moving from the world of the Bible to the world of today.